Not all job agencies in Basingstoke are the same but we reckon there is one thing we’d all agree on – our industry is all about talking to people. At Wote Street People we’re on an ongoing quest to make sure that we’re meeting our customers’ expectations; that’s why we send out a feedback form after each registration interview. 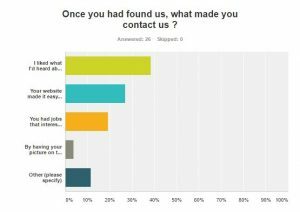 We ask a range of questions ranging from how people found out about us to what made them contact us. Did they feel they were listened to? Would they recommend us to a friend? Over 46% of people find us via Google or another internet search engine, which tells us that our candidates often look for an agency they can trust rather than for a specific job. Coming in with the top score of over 38% was ‘they liked what they had heard about us’, which just goes to show that word of mouth really is our most powerful advertisement. Backing that up is another survey statistic we’re extremely proud of: 100% of people who registered face-to-face with one of our consultants felt that they were listened to and had time to discuss their career options. The same 100% also said that they would be happy to recommend us to friends and family. That’s reflected in the 25% of our placements (temporary or permanent) filled by candidates who were referred to us by someone they knew. Do you know someone who is looking for job agencies in Basingstoke? We’d love to meet them and help them find their dream role. Contact us on 01256 799127 to refer a friend.